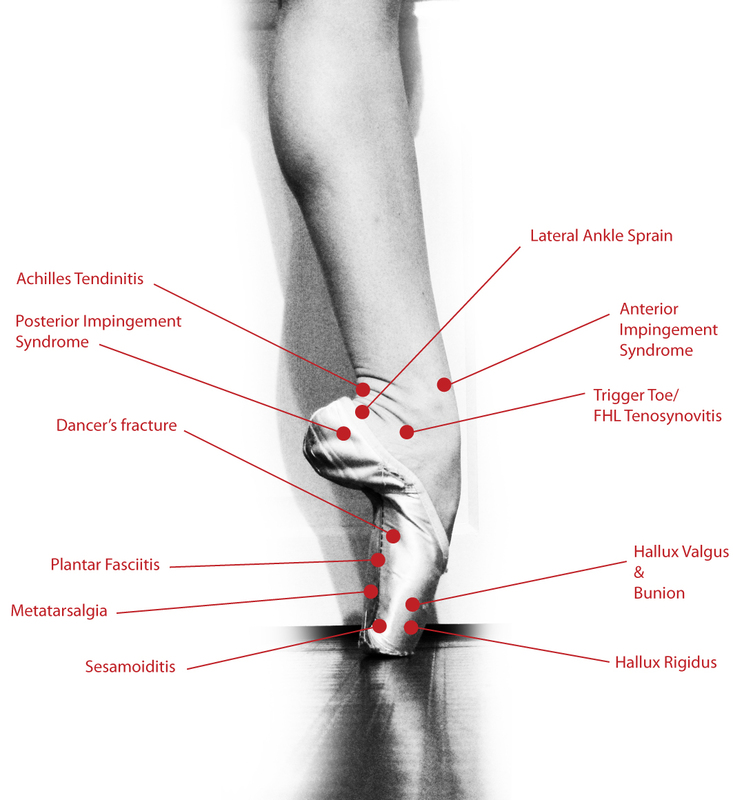 About now dancers in pre-professional programs, those starting back from a lazy Summer, or those simply not accustomed to the new level of pointe or technique they are experiencing will begin to feel pain in different places when dancing. It is no fun sitting out, but the wise dancer checks herself to see what is wrong and tries various remedies to heal the pain. It is human nature to do so, and those who ignore it could be in for some less than trifling troubles later. An unchecked injury, whether from overuse or a real problem, rarely gets better on its own if you dance through it. Anything to stop you is enough to verify the cause of. Who wants to wince with pain during a classical variation? 1) Proper training and teaching are essential to allow dancers of all ages to develop their skills without injury. If your school is having you overdo it then you have to watch out for yourself. That means make sure you are doing the exercises correctly, not repeating combinations twice or more a day because of duplicate classes, even if it means talking to the teachers and explaining to them this is all new for you and you need a little time to work up to full throttle. Proper training and teaching would encompass this rapport with your teachers-who else knows more about it than they? Talk to them. It is your instrument and they cannot replace it breaks and it is up to you. There is no warranty with your equipment-no customer service either! 2) Take adequate rest to allow the body to heal itself from daily wear and tear. If yours is a particularly rigorous schedule, rest often, do nothing in between, ice, soak, massage, apply cremes, take ibuprofen, use epsom salts, pamper yourself. No one else is going to. It gives your hands and fingers a workout. Try heat and ice, or hot water (as warm as you can stand it), then as cold to increase circulation and healing to the area. Obviously don’t do that which hurts you. Take it easy if you have a second portion of the day as rigorous as the first. Build up slowly and bring issues to the attention of some people who care so they can be thinking, researching and trying to find ways to help you, too. Don’t stay quiet about it. Cry if it helps. Dancing is not easy. You deserve to be pampered. The squeaky wheel gets the oil. 3) Maintain energy levels by eating and drinking adequately. No nourishment, or little nourishment, in dancers is a common cause of injury. Lack of nutrients causes the lessening of the production of Estrogen in the body and can lead to injuries. Better eat right! Take your daily vitamins (at least) and don’t forget to eat MEALS. Drink plenty of water. 4) Conditioning and strengthening of the leg muscles that support the arch are crucial. Yes, on top of dance, you need to ask your teachers for exercises that will increase the strength and flexibility of the muscles you are using everyday, so as to try to keep up with what will be expected of you. 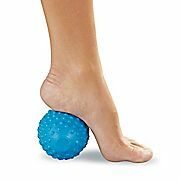 Ask your teachers for foot strengthening exercises. If they hurt, it is probably a sign that you are weak and need to strengthen. Flexibility and strength in the foot of a dancer is critical, wouldn’t you say? I mean you can’t dance without them-that would look funny. Use a tennis ball, rotate them, point and flex them, put them under the bed, sit on them-DONT’ BE LAZY. 5) Try to avoid dancing on hard or uneven surfaces, which could cause injury. What surfaces are you dancing on everyday? walking on? Where is the impact being absorbed? This is pretty hard to prevent, but perhaps classes should be held in the studios with raised flooring, but those are often not available. Wearing pointe shoes and even tightly fitting ballet shoes all day takes its toll. Shoes that are too tight, too narrow, or do not have proper arch support can also lead to increased problems, swelling and even fractures. Try to reassess all you are doing before you blame the floors. Chances are something will cause improvement, if you try. Are your straps or ribbons too tight? Are you releveing properly? Are you sickling? are you using your plie in your jumps? Landing properly? Check everything. Keep track-keep notes, dates and times, so you can look back and say, “during this class this happened and after class I felt this way.” Then you begin to see a pattern of activity, or action, which cause pain, or relieves it. 6) Take care of your shoes! Wet and worn out shoes are not supportive, and without support and on pointe for long periods of time, any dancer will experience pain. Stress moves to other soft tissues when a dancer compensates, causing injury to those areas as well. Keep them clean and dry, adding alternating pairs to your collection as needed for rotation. Always put your feet first! Skip the new leotard-better get shoes! Try different shoes for different classes. Sometime a higher vamp might be necessary for extended dancing as the foot can strain with overuse. Support, support, support! 7) Dancers should adopt new training schedules slowly. This is the number one ignored reason for overuse injuries by students because they AND teachers press forward, into maxed out training schedules, failing to accommodate for rehearsals, competitions, etc. Too much, too soon, can result in an injury and especially when taking even one day off, but especially a few, take it easy when you return, stretch as opposed to dancing hard even if you risk insults, it is better than injuring yourself just to keep up. How are you going to have a career in dance if you injure yourself permanently???? I never think returning to pointe on Monday is a good idea, but after a week off no pointe should be taken for a few days. You have to build up again. after a Summer, WELL! what do you think? Get plenty of rest at home. Even if that means going directly to bed after supper. Feet up. Soak, Massage, Eight hours. Why do you think professional dancers like to sleep late? And they DO!!! 8) Not everyone can have custom-made dance shoes. Although not always possible when dancing, but more so off stage or out of class, wear supportive footwear, and if you need to wear orthotics, wear them as often as possible. I recommend a wide variety of gel arch/foot supports, shoes and ZUMIES (AT CVS) for walking around the house. As important as the surfaces in the studio, are the street, sidewalks and concrete flooring found everywhere. 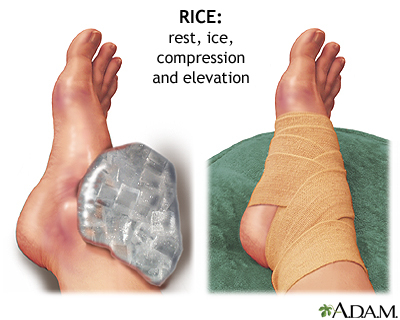 A dancer lives on their feet and especially sore, they feel everything! Put your feet up. Try wrapping your feet to see if that stops or relieves the pain. But always, wear special and comfortably supportive footwear out of class. NO PAYLESS GARBAGE. Good shoes. Not always sneakers either because they do not have enough support on the sides. Finding good shoes should be a number one priority and just another example of how you should treat your feet. Would you put a baby in those shoes? Your mothers did not and how dare you treat yourself less well and carefully than they would! Pronation and fallen arch foot pads. All dancers have impact to their feet. Fact. 9) Although I have already expounded on this in other articles, I will say it again: If dancers perform excessive pointe or demi-pointe work one day, they should focus on other types of work during the next workout. Try skipping the second technique class. Move your schedule around to try not repeating movements or overusing certain muscle groups. If you are doing variations, repertoire, privates and rehearsals-you do not need a second technique class everyday. Try jazz and modern, yoga, pilates, anything but a repeat of the same exercises you already did once in the morning. I have heard some dancers attribute their superior technique to 2 technique classes per day. On some level this might be okay, such as during Summer, or when other classes are not available, or when the opportunity arises (such as master classes), but one has to be very careful not to overdo it everyday. 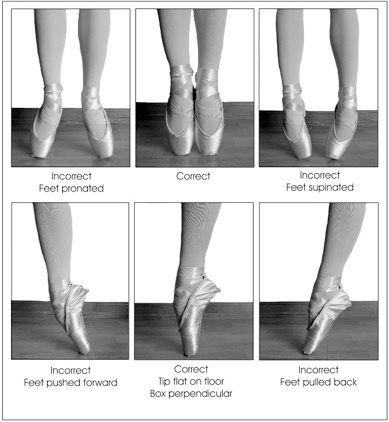 Repeating exercises with the hips, tendus, feet and other movements can cause overuse injuries in dancers that have not built up the stamina and strength to do this. at any rate, we are all just like the Duracell Bunny-at some point, there is a limit. Don’t let that happen when you are so young! Make an effort to work on different muscle groups and not repeat the same exercises. Don’t wait for a f.l.y. guy or your MOM-massage your OWN feet! 10) Most importantly, early recognition of symptoms is key to understanding the cause. Stop activity if pain or swelling occurs. If the pain persists after a few days rest, consult a sports-medicine physician or preferably a dance therapist or doctor. It is sometimes worth traveling to see one as opposed to getting the wrong advice. Work to break bad habits: leaning in one’s hips, poor posture, not pulling up on point, sickling. Left to chance, these might throw off all of your good training, creating areas of weakness and poor alignment which can literally stop a performance career. Fix these things now, and never look back on them, don’t keep nursing them. They are easier to correct than the one million ways they can cause you more problems in the future left unattended. Keep on Dancing! Previous Post▶ Marguerite and Armand – Sergei Polunin and Tamara Rojo The Royal Ballet – YouTubeNext PostManuela Vargas & Company (Ed Sullivan) dvd: A Little Flamenco Get the Juices Flowing!